Publication details: Book. 2003. x and 230 pages. Publication date: 2003-08-20. 76 figures, of which 44 in color, and 18 tables. Paperbound. 16x24 cm (6.3x9.4 in). 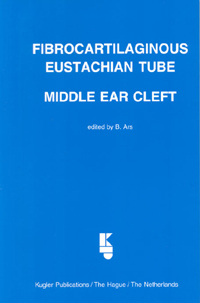 It is my pleasure to write a Preface to Fibro Cartilaginous Eustachian Tube - Middle Ear Cleft, edited by Bernard Ars. Professor Ars has dedicated his career to improving our understanding of the gas exchange in the middle ear and mastoid, as it relates to ear disease. He has assembled a group of internationally recognized authorities in the areas of middle ear and mastoid gas exchange, middle ear disease, eustachian tube anatomy and physiology, and innovators in the surgical management of eustachian tube dysfunction. Acute and chronic ear disease continues to be one of the leading diseases of childhood. Understanding eustachian tube function and management remains one of the most important aspects in controlling inflammatory ear disease. Chronic ear disease requires elaborate surgical interventions designed to bypass eustachian tube dysfunction and/or poor mastoid aeration, since surgical management of the eustachian tube has been elusive. Our understanding of the ear and hearing continues to expand at record pace, as auditory neuroscientists discover the fundamental molecular structure and function of the auditory system. The cochlear implant has revolutionized the treatment of deafness. In contrast, the complexity of eustachian tube pathophysiology is only just beginning to be appreciated. This book provides a detailed analysis of contemporary knowledge on the morphology, physiology, and gas exchange function of the eustachian tube, middle ear, and mastoid. Newer diagnostic tests, such as sono tubometry, tubomanometry, and endoscopic video-analysis, are also described. Finally, a selection of innovative surgical management strategies for eustachian tube dysfunction is presented. The clinical impact of these diagnostic tools and surgical management options still requires the test of time, as well as investigation by others. This text provides the trainee, clinician, and researcher with the opportunity to acquire state-of-the-art information in a single volume. I am certain that this is just the beginning of our knowledge of ways in which to improve the management of one of the long-standing chronic conditions that result in hearing loss and more serious sequellae. The fibrocartilaginous eustachian tube is part of a system of contiguous organs including the nose, palate, rhinopharynx, and middle ear cleft. The middle ear cleft consists of the tympanic cavity, which includes the bony eustachian tube (pro-tympanum) and the mastoid air cells system. The tympanic cavity and mastoid cells are interconnected and allow for gas circulation with pressure regulation and gaseous exchanges. The fibrocartilaginous eustachian tube is not a simple tube, in fact, but rather a complex organ consisting of a lumen with its mucosa, cartilage, surrounding soft tissue, peritubal muscles (i.e., tensor and levator veli palatine, salpingopharyngeus and tensor tympani), and superior bony support, the sphenoid sulcus. mucociliary clearance into the rhinopharynx of secretions produced in the middle ear cleft and carried out in its inferior part. How we should define and measure 'good tubal function' is still far from apparent! There is a wide range of normal variation, and we still lack the necessary tests for discriminating between normal and abnormal function with clinically relevant correlation. Tubal function is an intrinsic and important component of the middle ear pressure regulation system. In the event of tubal dysfunction, coordination between the various components fails, and a cascade of consequences ensues. including disorders of one or more of the muscles involved in the above three processes, and/or disorders of the pressure and gas mixture, receptors of the entire system. At the present time, there is no consensus of opinion on this, and 'tubal dysfunction' remains an abstruse concept! It is our hope to present a critical and contemporary evaluation of this subject and to provide information which will lead to further advancement in this field. The objective of this book is to bring together clinicians and basic scientists interested in tubal function, with special emphasis on tubal dysfunction and chronic otitis media. Fruitful collaboration between the various disciplines can do much to improve the diagnosis and therapy of tubal dysfunction and middle ear disease. The book is organized into five sections covering: history, morphology and physiology, clinical tubal functional evaluation, and therapeutic management of tubal dysfunction. It brings together a well-represented faculty of experts who supply overviews and present topical state-of-the-art information within their respective areas. We are indebted to those authors who accepted our challenge and made a positive, realistic contribution to this critical clinical topic. Another goal of this book is to encourage clinicians, residents, and young investigators to become familiar with unsolved research challenges. It has been set up as an informative work of analysis and reference, intended for future use in both fundamental and applied research or, in other words, as an educational tool.